The crew of Apollo enter the Lunar Module Eagle for the first time, and make an unplanned television transmission of their activities. The camera is performing extremely well and shows the interior of the lunar lander with unprecedented clarity. TV transmission from the spacecraft begins at 055:09:00 showing the crew manoeuvring the CM forward hatch into its storage bag within the CM cabin. This is Apollo Control at 55 hours, 10 minutes. Our network controllers just advised that we are receiving live television at Goldstone. We would presume this is a test of the system, similar to what we received from the crew yesterday. The crew is planning to send television from the Lunar Module when they ingress. Stand by - here's a call to the crew. 055:09:58 Duke: Apollo 11, Houston. We're getting the TV at Goldstone. We're not quite configured here at Houston for the transmission. We'll be up in a couple of minutes. Over. 055:10:13 Aldrin: Rog. This is just for free. This isn't what we had in mind. That was CapCom, Charlie Duke, advising the crew that we're not quite prepared for television reception at this time. You heard Mike Collins respond that this one's for free. We still intend to get the television transmission during the time the crew is in the Lunar Module; beginning at about 56 hours, 20 minutes Ground Elapsed Time; which would be about 4:52 PM Central Daylight Time. It seems to this listener (Woods) that it is Buzz, not Mike, that speaks. We are getting a black and white television picture in the control center at this time and we should have that in color by now. 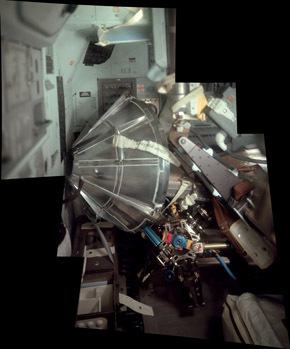 Interior view of the Command Module looking up into the LM hatch, CSM/LM hatch area. We can't quite make out which crewman we're seeing up in the tunnel working with the probe and drogue assembly. Getting a very good view of the work going on in the Command and Service Module tunnel. That appears to be Neil Armstrong working in the - in the tunnel. Operating - working on the drogue and probe assembly. This extremely sharp, clear picture is coming to us from about 175,000 [nautical] miles [324,000 km] distance from Earth. Presently about 48,000 [nautical] miles [89,000 km] from the Moon. And that appears as if it might be all the free TV, as Mike Collins [means Buzz] put it. Not forgetting, we do expect to get the television transmission from the time the crew is in the Lunar Module, and that period of activity is scheduled to begin at about 56 hours, 20 minutes with the ingress to the Lunar Module. And we are starting to get a picture back again. Losing lock momentarily and now we have it back again. Neil Armstrong, up in the tunnel at this point, removing the probe and drogue assembly in preparation for the ingress to the Lunar Module. Our network controller just reported that this television is coming to us on the 210-foot dish antenna at Goldstone, California. 055:19:49 Duke: Apollo 11, Houston. It's a pretty good show here. It looks like you almost got the probe out. 055:19:54 Aldrin: Yeah, it's loose now. 055:19:55 Armstrong: Can you see that? 055:19:58 Duke: Rog, Neil. It's really good. 055:20:03 Armstrong: Not much light up in that area, but apparently the TV set's able to pick it up. 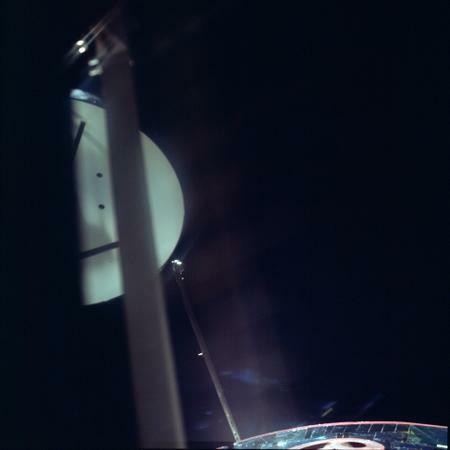 055:20:10 Duke: There are some bright spots shining on the probe. Apparently Sun shafting on it that just gets just about enough for us to make it out. Over. 055:20:21 Aldrin: I think those are the tunnel lights. 055:20:32 Aldrin: Okay. It's loose now. Coming down. 055:20:57 Duke: Looks like it's a little bit easier than doing that in the chamber. 055:21:05 Aldrin: You have to take it easy. It's pretty massive, but it goes where you direct it. The 12-second delay is due to the videotape technique used to correct the timing of the TV signals prior to their conversion to colour. 055:21:27 Armstrong: Mike must have done a smooth job in that docking. There isn't a dent or a mark on the probe. 055:22:00 Duke: 11, Houston. With a 12-foot cable, we estimate you should have about 5 to 6 feet excess when you get it - the camera into the LM. Over. 055:22:14 Duke: We can see the probe now. Correction, the drogue. 055:23:04 Armstrong: Okay. Drogue removal's coming next. Once removal of the drogue is completed, they will have access to the LM hatch and be able to go into the tunnel. 055:24:35 Duke: 11, Houston. Looks like you're pretty crowded in there with that drogue. Over. 055:24:43 Armstrong: Oh, it's not really bad. AS11-36-5382 - The drogue after it had been brought into the CM cabin. Below it is the docking probe. Image by LPI. AS11-36-5383 - The docking probe along with the drogue after they had been brought into the CM cabin. Image by LPI. AS11-36-5384 - The drogue in the LEB after it had been brought into the CM cabin. Panel 226 is beyond. Image by LPI. Composite of AS11-36-5382 to 84 - Created by journal contributor Jon Hancock, this single view shows a wider context of the drogue in the CM cabin. 055:25:20 Collins: The only problem, Charlie, is these TV stagehands don't know where to stand. This unscheduled television transmission has now run about 18 minutes, and we have no estimate at this point as to how long it will continue. Mike Collins reported that it would - we would go ahead with the regularly scheduled one when they are in the LM. 055:26:28 Duke: Apollo 11, Houston. Do you have a little white dot in the bottom of your monitor - TV monitor? Over. 055:26:39 Aldrin: Roger. We do. 055:26:56 Aldrin: Okay. We might have got just a little bit of Sun in there. Is it just one small white dot? Have a good view here of the computer and display and keyboard assembly with the green lights flashing. 055:27:42 Collins: We went up in the tunnel checking the roll angle, Charlie, and it's 2.05 degrees. 055:27:48 Duke: Roger. Copy. 2.05 on the roll cal. 055:27:55 Collins: And that's a plus. The reference to the roll cal, or roll calibration index marker in the tunnel, which shows how far off exact zero the two vehicles were when the docking occurred. When the LM is finally activated before it flies free, it will get an approximate IMU alignment from the CM IMU which the crew does manually. However, the coordinate frames of the two vehicles are different so a conversion will have to be done that takes into account that their roll axes are mutually perpendicular and that the LM is rotated 60° from the CM, hatch to hatch. The 2.05° offset in the alignment of their docking rings will also be taken into account. 055:28:45 Duke: 11, Houston. The tunnel looks pretty clear to us. Somebody going up there now. Over. 055:28:53 Armstrong: It's Mike checking his connectors up there now. 055:29:08 Duke: 11, Houston. The lighting up in there looks very good to us at this time. Over. 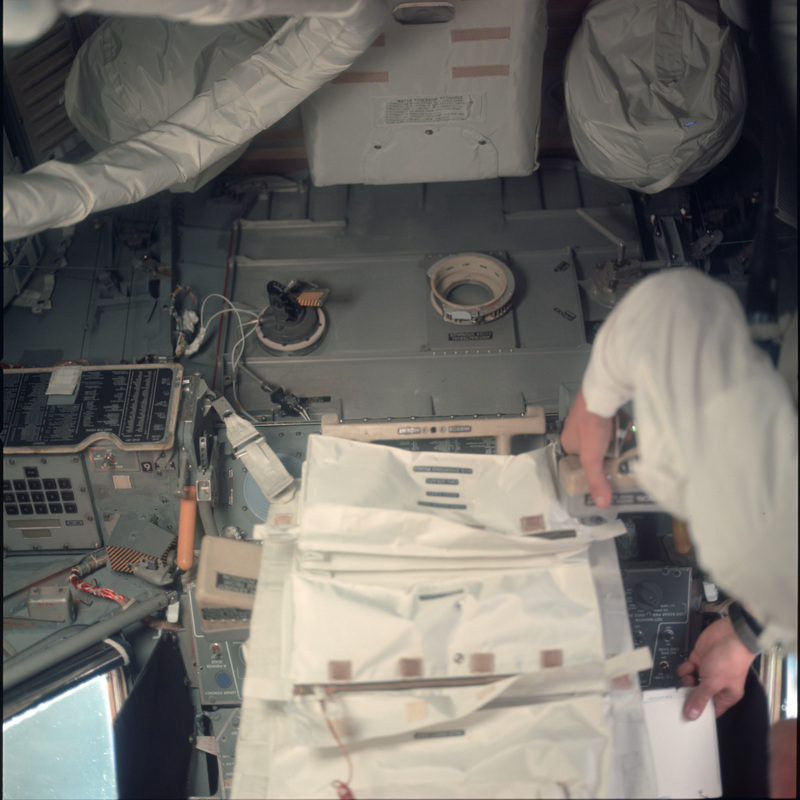 055:30:05 Collins: Well, the docking latches look good today just like they did yesterday. Everything up in there looks just fine. Mike Collins reporting there on the appearance of the docking latches. 055:30:45 Duke: 11, Houston. We can even read the decals up there on the LM hatch. 055:30:53 Aldrin: Well, let me zoom it up and see how much you can read. 055:31:11 Duke: We can see the LM umbilical connection quite well there, Buzz. We see you zooming in on one of the decals now. It's: 'To reset, unlatch handle; latch behind grip and pull back two full strokes'. That's about all we can make out. 055:31:35 Aldrin: Hey, you get an A-plus. 055:31:37 Duke: Thank you very much, sir. At least I passed my eye test. 055:31:46 Collins: I'm standing 6 feet from it, Charlie, and you can read it better than I can. There's something wrong with the system. An interested observer of these amazingly clear pictures coming to us from more than 175,000 miles out in space is astronaut Gene Cernan, who got a first hand view of some of this same area of the spacecraft during his Apollo 10 flight. 055:33:08 Duke: That's a real good view of the LM hatch handle there, 11. Over. 055:33:24 Armstrong: Looks like we'll be ready to go into the LM early if that's okay with you all down there. 055:33:57 Duke: 11, Houston. The white spot you see on your monitor, our TV people say it is a burn spot; but they expect it to dissipate after a couple of hours. Over. 055:34:14 Aldrin: Roger. Thank you. 055:35:23 Aldrin: Okay, the dump valve is actuated. 055:35:26 Duke: Roger. Copy, 11. We see that very clearly. Is that you, Buzz, with your hand on it? 055:36:10 Duke: 11, Houston. We're really amazed at the quality of the picture up in the tunnel. It's really superb. Over. 055:36:18 Collins: It is, considering the amount of light up in there. 055:36:20 Armstrong: Roger. We're about to open our hatch now. 055:36:32 Collins: There's that same guy that, when you open up the door, why, he's waiting there for you, and he turns the lights on. That conversation between Charlie Duke and Mike Collins referring to the automatic light that comes on in the LM when the hatch is opened. 055:37:28 Armstrong: We don't see anything loose up there. 055:37:30 Duke: Well, great. Looks good to us. We see the helmet storage bag. 055:37:53 Duke: Hello, 11. Houston. We got a view of the PLSS there, off the right of our screen. 055:38:35 Duke: 11, Houston. Buzz, you already in? Over. 055:38:42 Aldrin: Rog. I'm halfway in. I'm gonna start turning around, I guess. Buzz Aldrin reporting that he's halfway into the LM. This view is inside the LM cabin. 055:39:14 Duke: Apollo 11, Houston. We'd like you to read out the LCG reservoir sight level. Over. 055:39:50 Duke: 11, we have a good view of the window there. It looks like the Sun's fairly coming through the shade. 055:40:00 Aldrin: Yeah, I'm afraid it's - We're just about plus-Z toward the Sun. 055:40:05 Duke: That's affirmative. This attitude put both windows right toward the Sun for the LM. Over. 055:40:15 Aldrin: Well, that may be good in some respects. 055:40:22 Duke: We had a view, Buzz, of the utility light cord. 055:40:31 Aldrin: Now let me show you a view looking the other way. 055:40:33 Duke: Rog. And we see right now the utility light or either the floodlight up there. Buzz Aldrin has apparently carried the camera into the LM with him, showing us Neil Armstrong and Mike Collins back in the CSM. 055:41:33 Duke: 11, Houston. That's a really a beautiful shot. 055:41:46 Duke: 11, Houston. We didn't quite decipher that signal that just came from the CMP. 055:41:55 Collins: Just saying hello. 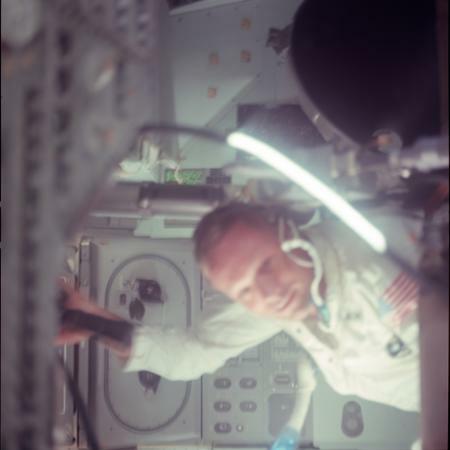 055:41:57 Aldrin: On the LCG sight gauge, you got about - oh, it looks like the white mark that's in the plunger is about a quarter to three-eighths inch out into the green, away from the red. Is that what you'd like to see? Over. 055:42:18 Duke: Stand by. Rog, Buzz. That looks good to us. Thank you much. 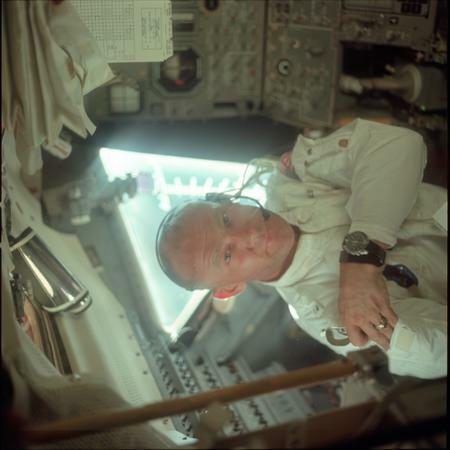 055:42:28 Aldrin: It is the white index, is it not, that you're interested in comparing whether it's in the red or green? 055:42:34 Duke: Stand by. That's affirmative, Buzz. It looks good. That's a good reading for us. Over. 055:42:46 Duke: We had a shot momentar - a moment ago of the suit disconnect valve. 055:43:24 Duke: 11, Houston. That's a real good view. We have the AOT. You're back now, Buzz, and notice you're taking down one of the window shades. Over. 055:43:36 Duke: The light is superb! 055:43:37 Aldrin: How's the Sun coming in? How's the Sun coming in from this direction going to affect what you can see? 055:43:44 Duke: It made it really super. The lighting is excellent in the - in the LM right now. We can make out the AOT, the ISA, and the left-hand window - there's a little glare off of that, but the LMP side the - with the shade down, it's really excellent. Over. 055:44:08 Aldrin: Well, let's - I'm turned around, why I took the shade off my side first. 055:44:16 Duke: Roger. We copy. The light level for the TV is really excellent. Over. 055:44:29 Armstrong: Yeah, the lighting in the LM is very nice now, just like completely daylit; and everything is visible. A good bit lighter than the tunnel was earlier. 055:44:43 Duke: Roger. We got a good view now, Neil, of the DEDA; and also Buzz's ACA. 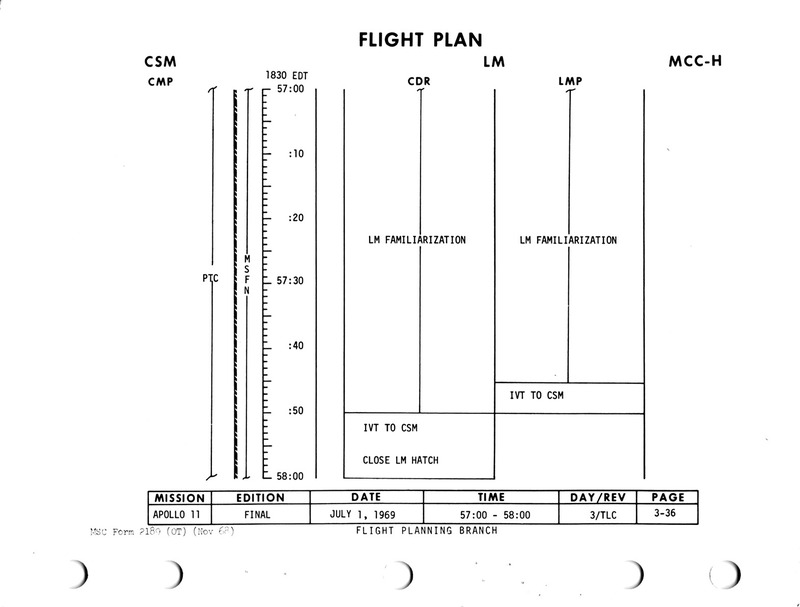 This ingress to the Lunar Module came about 40 minutes ahead of the Flight Plan, and we would presume that the unscheduled TV is perhaps merging with the schedule a little bit early. 055:45:05 Aldrin: Hey, I'm pointing it at the front hatch now. Everything seems to be in place down there. 055:45:11 Duke: Roger, we got the dump valves in view. Over. 055:45:44 Duke: 11, Houston. We see you removing the ISA now, folding it up, putting it up by the AOT. The instrument panels are coming into view behind. 055:45:58 Aldrin: Yeah, I think it'd probably be best, since we've done the SPS burn, to put it back over the instrument panel instead of putting it up over the PLSS on the recharge station. Would you care to comment on that one? We could do either just as easily. 055:46:12 Duke: Stand by. We'll have an answer for you momentarily. 055:46:59 Aldrin: The vehicle is surprisingly free of any debris floating around. It's very clean. 055:47:17 Duke: 11, Houston. It's pretty hard to describe this view. It's really - really great. 055:47:23 Aldrin: Now you know how we feel. 055:47:30 Aldrin: Okay. Neil's OPS is about 57, 5,800 [psi]. 055:47:36 Aldrin: And mine's about 5,800, also. Aldrin's hand resting on one of the Portable Life Support Systems which will be used on the Moon's surface. 055:48:40 Duke: 11, Houston. That moment - a moment ago, we had a good shot of your PLSS, Buzz, and the two helmet stowage bags. Down behind your left shoulder, Buzz, we have the - the DSKY and the ACA. We're not quite sure who's holding the camera at this point. Apparently it's drifting freely inside the cabin. Or more likely attached to some convenient point within the LM cabin. 055:50:01 Aldrin: We're going to go ahead and take all the [garble] data on back into the Command Module, Charlie. This television transmission has now been running about 42 minutes, and the spacecraft now about 176,000 [nautical] miles from Earth. 055:50:58 Duke: Apollo 11, Houston. Buzz, it appears that you're intending to put on the Sun filter and view the Sun through the AOT. Over. 055:51:09 Aldrin: Yeah, unfortunately it looks like it's down a little bit more towards [garble] than I can be able to see in the AOT. 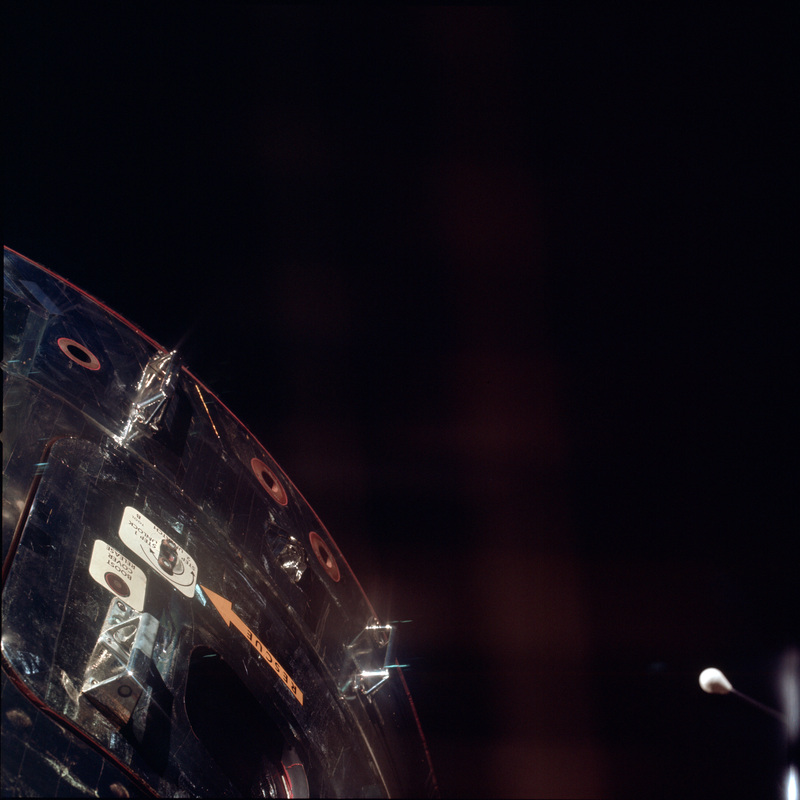 055:52:15 Aldrin: We got a beautiful view of the side of the Command Module out of the AOT looking in the left rear detent. 055:52:24 Aldrin: I can see the hatch and all the - all the EVA handrails. First time we've seen the silvery outside of the Command Module. 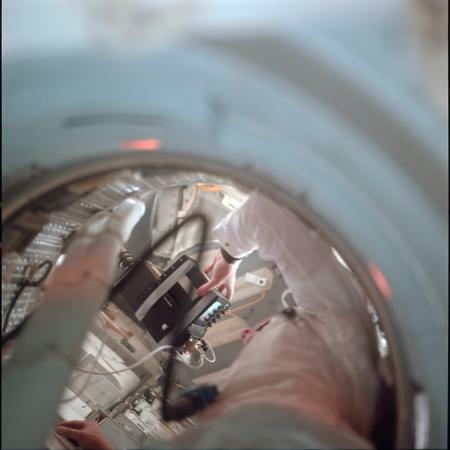 055:52:40 Aldrin: I can read the letters on the hatch cover. It's a boost cover release; and the big yellow arrow that points toward the opening - place where the tool B goes. 055:53:04 Duke: Go ahead, Buzz. Over. 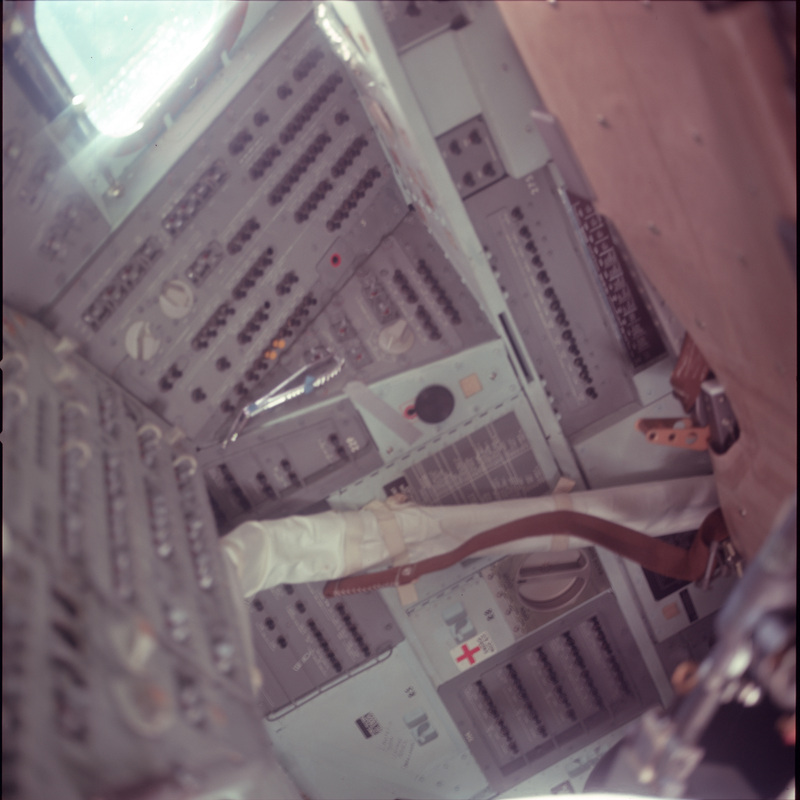 055:53:08 Duke: I was just saying we got a great shot looking back into the Command Module. 055:53:14 Aldrin: Okay. And the left detent, I can see the AO - or the rendezvous radar, and I move to the forward detent and that's about all I've got. I'm looking eyeball to eyeball. Neil Armstrong has apparently been holding the camera, looking back down through the tunnel. It appears now that he's handed the camera to Buzz Aldrin. As he is still looking back through the tunnel, we see Mike Collins in the background there. 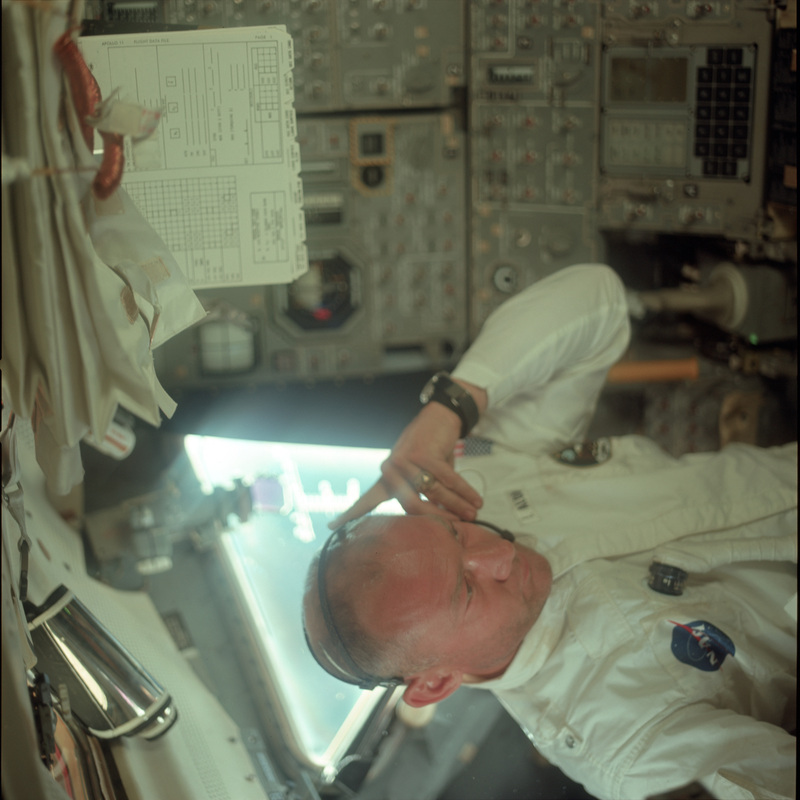 055:54:08 Aldrin: Charlie, is there any concern about the duration that we ought to have the window shades open? 055:54:17 Aldrin: We don't have - We don't have any circulation in here, and it might get a little on the warm side. 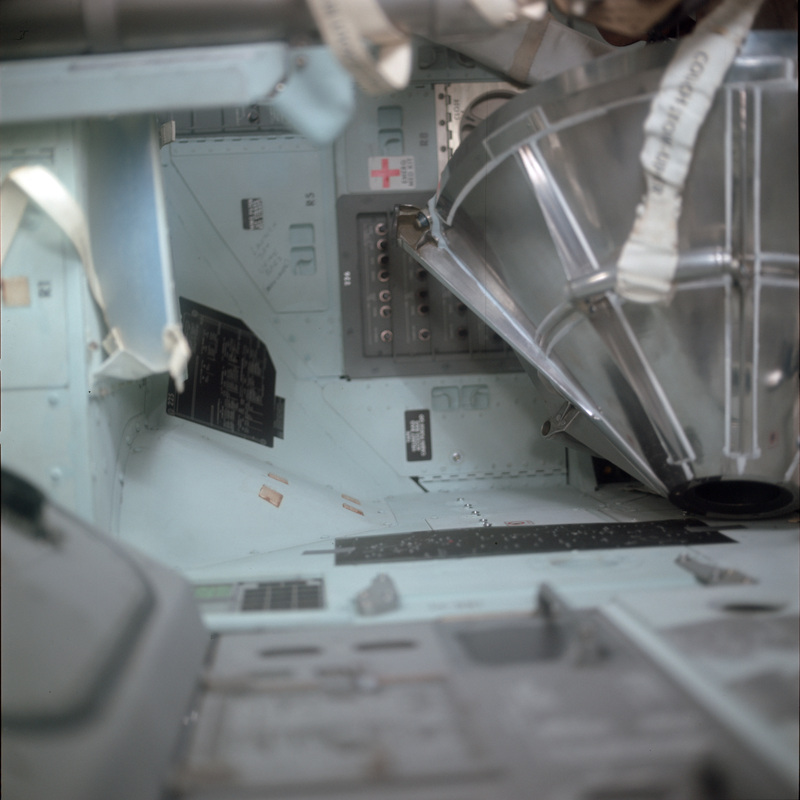 055:54:30 Aldrin: We'll - We'll put up a couple of hoses in the Command Module here and get a little circulation going. 055:55:04 Duke: Apollo 11, Houston. As far as the window shades go in this LM, there's nothing except for crew comfort. I don't think we've got any systems problem. Be sure to put them back up when you egress. Over. 055:55:52 Aldrin: Charlie, I'll give you a view out of the overhead window, back looking at the Command Module right-hand rendezvous window. 055:56:19 Duke: Well, we see it now. Thanks a lot, Buzz. That's a good view through the overhead. 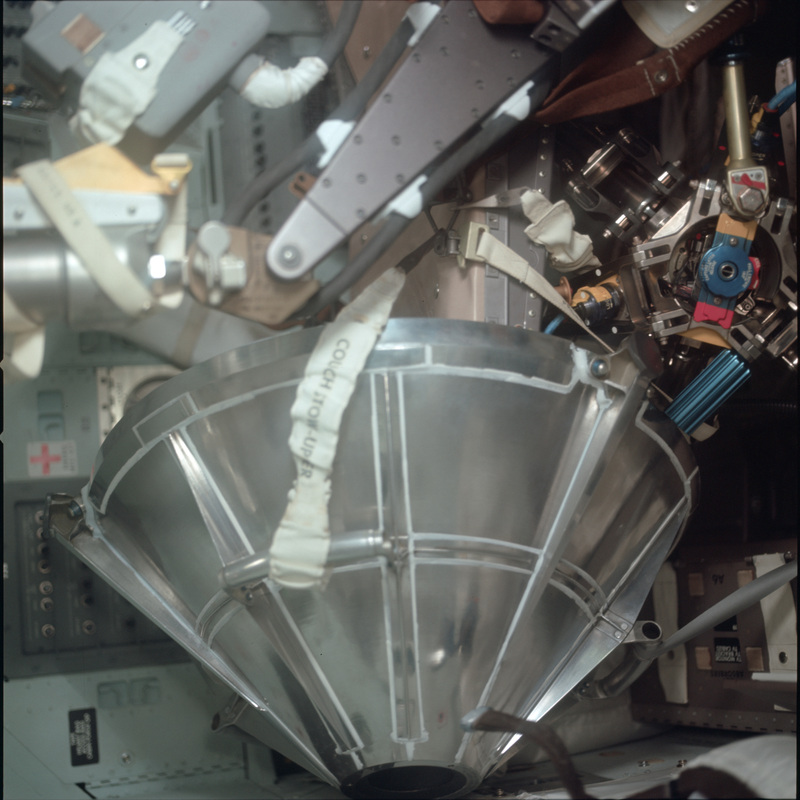 055:56:38 Aldrin: One washer's on by the overhead. 055:56:49 Duke: There we go. We got it now. 055:56:58 Armstrong: There wasn't very much debris in the Command Module or the LM. We found very few loose particles of bolts, nuts, and screws and lint and things. Very few in each spacecraft. They were very clean. 055:57:45 Duke: 11, Houston. We have a good view out of the rendezvous - correction, the overhead window of the LM. We don't see anybody staring back at us, though. Over. 055:59:03 Aldrin: Charlie, can you see Mike's two eyeballs staring out through the rendezvous window? 055:59:11 Duke: 11, Houston. Stand by. We haven't picked him up yet. 055:59:22 Armstrong: You're looking through a lot of layers of glass. 055:59:40 Aldrin: [Garble] on my monitor. 055:59:41 Duke: We had a slight glimpse of Mike in the rendezvous window at that time. It's pretty murky looking into there, though. 055:59:48 Aldrin: Okay. Here he is; I've got him. I've got him on the monitor now. 056:00:28 Duke: Apollo 11, Houston. Our recommendation for the ISA is to stow it back over the instrument panel. Over. 056:00:42 Aldrin: Roger. Will do. This transmission's been running about 54 minutes at this point. 056:01:56 Duke: 11, Houston. We can make out the markings on the panel. We read System A Ascent Fuel, Ascent Oxidizer. Quad 1, quad 4. The - It's really unbelievable, the definition we're getting down here off that little camera. Over. 056:02:14 Duke: We can even see the barber pole on the talkbacks. 056:03:27 Duke: We see you raised the cover on the abort stage. We don't recommend that. 056:03:34 Aldrin: Yeah. We're going to tape that one over. 056:03:36 Aldrin: We're going to tape that one over. 056:03:44 Aldrin: The restraints in here do a pretty good job of pulling my pants down. 056:04:17 Duke: 11, Houston. That's a good view of the eight-ball. We see - You can even read the Off flag, there. At this point, we've had to take the color down momentarily. We've run out of tape on the color conversion recorder. We estimate we'll have the black and white for about 5 minutes while the tape change is in process and then continue to convert in color after that point. The function of the videotape recorder is to synchronise the timing of the spacecraft's video signal with the much more accurate timings of the local TV electronics. This is prior to a magnetic disk recorder and other electronics that will actually produce the standard composite colour TV signal from the sequential colour signal that comes from the spacecraft. The videotape recorder in this case is actually two machines. The first records the sequential colour signal coming from the spacecraft onto tape, doing so while synchronising itself to the timing of this incoming signal. Then, rather than this tape being passed onto a take-up spool, it works its way over to a second videotape machine. Here is it replayed but in this case, its timing will be synchronised with the local TV electronics. The reason for this elaborate timing correction is that the movement of the spacecraft with respect to Earth causes unacceptable timing shifts that make the video signal unusable. In all, this processing adds at least 10 seconds delay to the pictures when compared to the audio arriving from Apollo 11 at the same time. 056:04:54 Aldrin: Houston, did you want us to test the cameras in the LM and - I was wondering about that. I saw it in the Flight Plan, but I'm just wondering if you want to do that on CSM power, or do you want us to take both of the 16-mm cameras back in the CSM and test them there? Over. 056:05:18 Duke: Stand by, Buzz. 056:05:21 Aldrin: As an alternative to that, why, we could wait 'til LOI day and do it then when we transfer over to LM power. 056:05:32 Duke: Roger. Stand by. We'll have an answer. 056:05:47 Duke: 11, Houston. On that TV, our commentary - The monitor I was looking at was delayed about 12 seconds, 12 to 15 seconds while it went through our color converter. It was probably - You thought I was crazy, but we were looking at it 15 seconds after you broadcast it. 11, Houston. 056:06:06 Collins: We understood that, Charlie. 056:06:08 Duke: Okay. On the LM cameras, we'd like you to do it on LOI day with the LM power. Over. The black and white view that you're seeing now is the unconverted color picture as it comes down from the spacecraft. The flicker, of course, is taken out in the conversion process. We've now been receiving television pictures from the spacecraft for about 1 hour. 056:07:16 Aldrin: Houston, we're showing you something that came out of the Commander's checklist stowage packet. It's got a 16-millimeter camera in it, and it's got this little cylinder; and I guess - I don't understand what it is. Maybe you can tell us. 056:07:35 Duke: Roger. Stand by. We can't figure it out either. 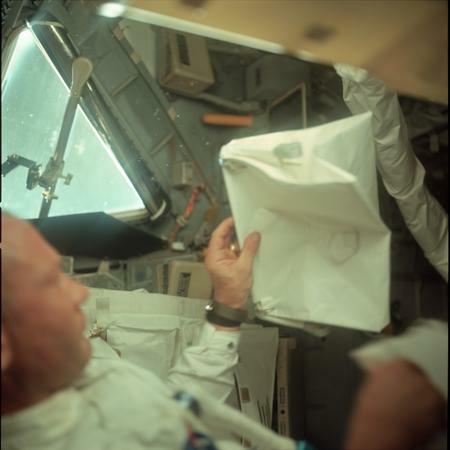 056:07:46 Aldrin: It's got an arrow on the back, and it says turn, but I'm afraid to turn it. 056:07:56 Duke: 11, your friendly geologist says it's the camera cank - crank, excuse me, for the 16-sequence camera if it jams. Over. The reference to the friendly geologist refers to astronaut Jack Schmitt who is here in the control center. 056:08:28 Aldrin: There's that word again. The ancillary stowage container. And we're back with the color. 056:09:51 Collins: Houston, 11. Are you still getting high bit rate off the omnis at this distance? 056:10:07 Duke: Apollo 11, Houston. About 50 percent of the time, we're getting high bit rate off the omnis when you're in PTC. Over. 056:10:17 Collins: Okay. Thank you. 056:11:24 Duke: Apollo 11, Houston. Neil, at this attitude you look like you're about 12 feet long. 056:12:29 Duke: Apollo 11, Houston. Could you give us a few comments on your crew comfort with the CSM hoses moving the air around? Over. 056:12:42 Aldrin: Well, it's picking up a little bit of circulation in here. 056:12:57 Aldrin: Oh, I'd say maybe 73, 75. 056:13:06 Armstrong: It's hard to tell at this density and pressure of gas, but the comfort level is about the - about the same as the Command Module. 056:13:21 Armstrong: It was a little warmer or stuffier when we first got in, but it seems to be improving. 056:14:32 Armstrong: ...some particles jumping around on your screen. That's just dust particles that are being illuminated by Sun shafting in the window. 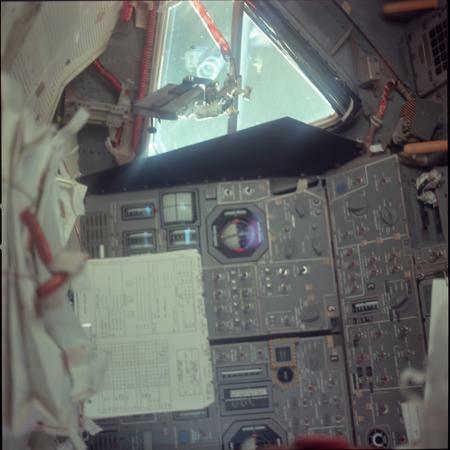 056:15:50 Aldrin: I can just barely see the handrail on the front porch from the position on the right-hand window. 056:16:15 Duke: 11, Houston. Our view of the Panel 11 is - gets brighter, then darker. Are you changing the f-stop at all? Over. 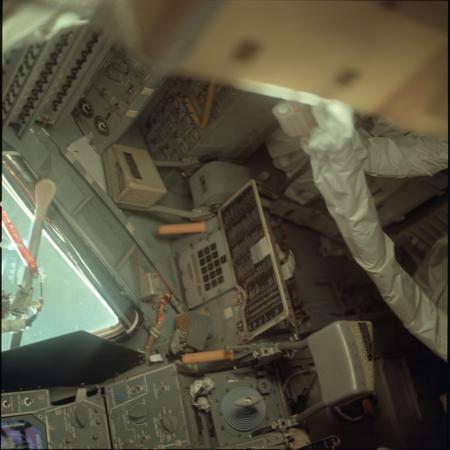 056:16:32 Armstrong: No, what's happening is, we get pretty close to the window now and then, and it drives the automatic light control into the stop, I think. 056:16:51 Aldrin: Yes, I had the switch on 'Outside' while I was going through the overhead window. That may be what's contributing to some of it. 056:17:05 Duke: 11, Houston. We seem to be picking up a few bit more dust particles now. We see them quite clearly in the screen now. Over. 056:17:41 Duke: 11, Houston. Your show is going out to the US now. We're about to get the satellite up. It'll be transmitted to some other countries after that. Over. 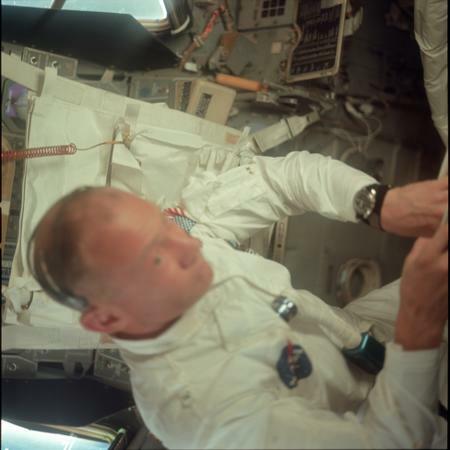 056:17:58 Aldrin: Roger. I'm checking out this window bracket where I'll be putting it for the EVA pictures of Neil going down the ladder. 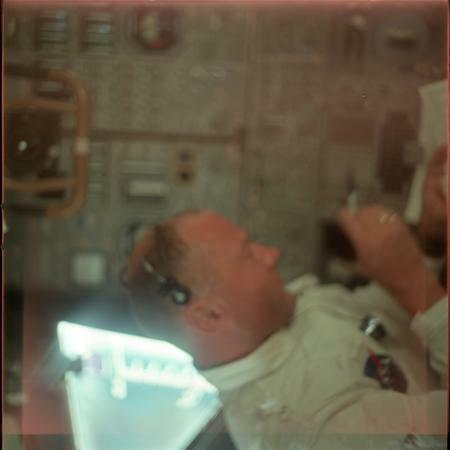 Buzz is referring to the film-loaded Data Acquisition Camera, not the TV camera, which he will later mount looking out of his window to record the descent to the Moon, and their excursion on the lunar surface. 056:18:41 Aldrin: I'll tell you, those new knobs really make it easy to twist the thing and get it cinched down quite tight. 056:20:06 Duke: 11, Houston. Buzz, how does the alignment look, there? 056:20:13 Aldrin: It looks pretty good, as well as I can tell without the gear extended. I can't get a real definitive answer, but you couldn't fix it any place to see much more out of the window without hand-holding it for the whole time. 056:20:29 Duke: Roger. Looks like to us it's going to work real well. 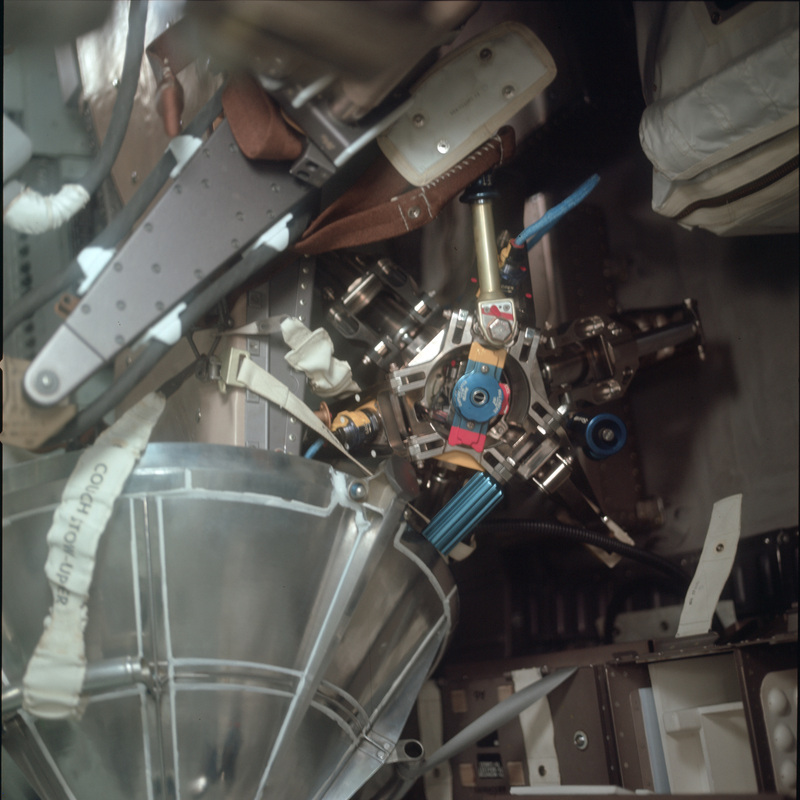 056:21:59 Armstrong: Houston, ask FAO if the 90-degree bracket isn't stowed in the Commander's stowage assembly. 056:23:35 Duke: 11, Houston. Buzz, you still looking for that 90-degree bracket? Over. 056:23:45 Armstrong: Yeah, he is looking for it now. 056:24:28 Armstrong: My monitor shows a pretty good, clear picture from this angle. And we found the 90-degree bracket. 056:25:25 Aldrin: That's about the position we'll be putting the camera in, after the initial descent down the ladder, and it'll be taking 1 frame a second for most of the EVA. 056:26:03 Armstrong: Our monitor is a little bit wavy, so it's hard for us to tell when we're - when we've got a steady picture for you. 056:26:11 Duke: 11, we have no complaints at all. We don't see that waviness on our picture. It's just really great. Over. 056:26:19 Armstrong: Do the edges of the window look like straight lines to you? 056:26:26 Armstrong: Okay. They don't in our monitor, and that leads us to make some corrections to the camera, which probably aren't required sometimes. 056:26:39 Duke: 11, we have no complaints at all. It's a magnificent picture. We've been receiving television now from the spacecraft for about an hour and 20 minutes. Apollo 11 presently 177,000 miles from Earth. 056:27:49 Duke: What was that, Buzz, you're chasing now? 056:27:55 Armstrong: That was - That was me picking up some particles of paint that were floating through the air in front of the camera, there. 056:28:26 Aldrin: Okay. For those of you that don't know, this is where we log most of our data for each of the LM maneuvers, and we have another card like this that the timeline book that we've laid down on the table in front of the data and display keyboard; and it's on this timeline that we have all our procedures, so we obviously have to hold these in place in zero g, so we make use of the Velcro patches on the back and on the table so we can attach these down here; and then we just turn the pages over when we go to new sequences in our timeline of procedures. 056:29:18 Aldrin: And we're ready to copy DOI PAD. 056:29:21 Duke: Rog. We'll have the FIDOs work that one up for you momentarily. 056:31:06 Armstrong: That'll be the most unusual position a cameraman's ever had, hanging by his toes from a tunnel and taking the picture upside-down. 056:31:41 Aldrin: We're giving you a picture now of the floor of the cabin. I think you can see the - one of the two Portable Life Support System backpacks here in the center, and on each side, we have the two helmet visors. I'll remove one of them and show you a little closer view of what this looks like. 056:32:27 Duke: Roger, Buzz. That's a great shot now that we're getting of the helmet, the EVA visor, and also the - the EVA gloves in the background. 056:32:41 Aldrin: Okay. You did say this was going out now, didn't you? 056:34:39 Duke: Hey, that's a good view of Mr. Collins down there. We finally see him again. 056:34:46 Collins: Hello there, earthling. 056:35:24 Duke: 11, Houston. We noticed when you were scanning over Panel 2 a moment ago, 1 and 2, the two eight balls were slightly in disagreement. Control said he'd like a AGS align, there. 056:35:39 Aldrin: Yeah. One of them's AGS, one of them's PNGS. 056:35:45 Armstrong: The problem is, we don't know whether to align AGS to PNGS or PNGS to AGS. 056:35:58 Duke: 11, Chris said he can tell you. 056:36:05 Aldrin: We'll cage them both. 056:37:01 Aldrin: Like old home week, Charlie, to get back in the LM again. 056:37:04 Duke: Rog. I can imagine. 056:37:24 Aldrin: The traverse from the bottom of the LM to the aft bulkhead of the Command Module must be about, oh, 16, 20 feet. It's not a disorienting one at all, but it's most interesting to contemplate just pushing off from one and bounding on into the other vehicle all the way through the tunnel. 056:37:56 Armstrong: We're - we're willing to let him go but he hasn't come up with the price of the ticket yet. 056:38:01 Duke: Rog. I'd advise him to keep his hands off the switches. 056:38:08 Collins: If I can get them to keep their hands off my DSKY, it'd be a fair swap. 056:38:18 Aldrin: That's why I've been eating so much today. I haven't had anything to do. He won't let me touch it any more. It appears now that we have a view of Earth out the window. 056:38:55 Duke: 11, Houston. If that's not the Earth, we're in trouble. That description from Neil Armstrong. 056:39:34 Armstrong: We have some horizontal banding in our TV monitor. Are we transmitting that to you, or do you have a clear picture? 056:39:41 Duke: Neil, we have a very clear picture. The only thing that we see is a little white dot in the bottom of our screen, which is - our TV guys say is an - apparently a burned out spot in the camera, but it should come back. Over. 056:40:20 Duke: 11, Houston. We do have three lines across our TV. I thought it was just a transmission problem, but everybody's telling me now that it's probably - it's on the downlink. Over. 056:40:35 Aldrin: No, those are the same three ones that we have. 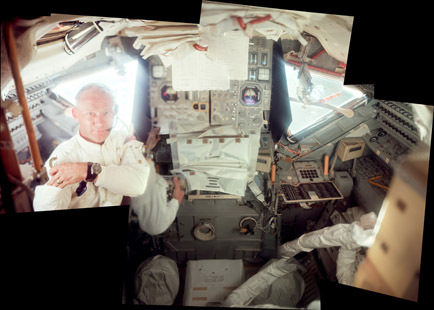 056:40:47 Aldrin: How far are - out are we now, Charlie? 056:41:00 Aldrin: Did you notice the difference between yesterday and today? This is as large an image as we - as we can give you. 056:41:05 Duke: Roger. It's distinctly smaller. You're now 177,000 miles out. Over. 056:41:14 Armstrong: That's nautical miles? 056:41:23 Collins: That in furlongs? 056:41:34 Duke: 11, Houston. We see the - still see the banding along the inter-tropical convergence. I guess the most predominate one now is around the - up in the - around the equator or slightly north of the equator. 056:41:51 Aldrin: Yeah, that's the way it looks, Charlie. Same as yesterday. 056:42:31 Armstrong: And Charlie, I'd like to say hello to all my fellow scouts and scouters at Farragut State Park in Idaho having a National Jamboree there this week; and Apollo 11 would like to send them best wishes. 056:43:32 Duke: 11, Houston. We have you - your sub-spacecraft point is just off the western coast of South America directly south of about Mexico City. Over. 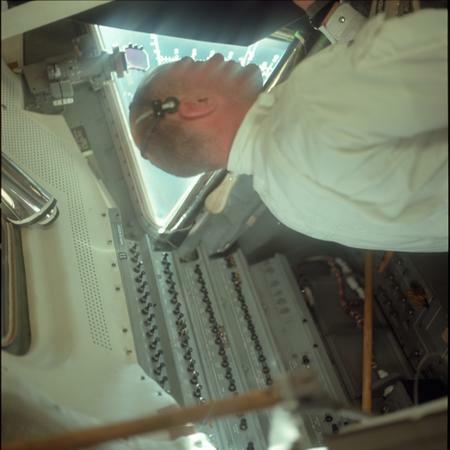 056:44:02 Armstrong: And we're going to turn our TV monitor off now for a short bit while we have some other work to do. Apollo 11 signing off. 056:44:12 Duke: Roger, 11. Thank you very much. That was one of the greatest shows we've ever seen. We sure appreciate it. Over. 056:44:20 Armstrong: It was a pleasure. This is Apollo Control. That television transmission lasted about 1 hour, 36 minutes according to our first rough calculation. And during that period of time, the spacecraft traveled something over 2,000 nautical miles [3,700 km]. 056:45:50 Duke: Hello, Apollo 11. Houston. Could you give us an idea of about how long it will be before you start close - closing the LM back up? Over. 056:46:00 Armstrong: We've got a little more work to do up here, Charlie. We're going to make sure that we have everything transferred around and stowed the way we want it. Try to get a little bit ahead on tomorrow's timeline. I suppose that we could be out of there in another half hour or so if it was necessary. 056:46:23 Duke: Roger, Neil. We're not trying to push you. We're just trying to get an idea of - about water dumps and starting up the PTC again. Take your sweet time. Over. 056:46:34 Armstrong: Okay. We'd like to get a Flight Plan update from you for the next couple of hours, here. When you think what the various constraints might be and what - what order you might like us to do things. 056:46:53 Duke: Roger. Stand by. We'll have that to you in a moment. This is Apollo Control at 56 hours, 51 minutes. Buzz Aldrin has now been in the Lunar Module for a little over an hour and 13 minutes. We estimate that Neil Armstrong has perhaps been in the LM about 15 or 20 minutes less than that. Due to the length of that television transmission, the change-of-shift press conference has been cancelled. The participants were unable to wait for the duration of the press conference and with other duties and the press conference has been cancelled. At 56 hours, 52 minutes; this is Apollo Control. 056:58:04 Duke: 11, Houston. Did you call? Over. 056:58:09 Armstrong: Roger. Just noticed that the mast that the EVA light is on is charred brown. It looks as though it took quite a beating during launch. 056:58:24 Armstrong: The EVA light still does work. 056:58:27 Duke: Roger. We'll let this - the SPAN guys look at this, and we'll be back with you with our - with what we think. Over. 057:00:21 Duke: 11, Houston. We were wondering, Neil, with your closing comment on the TV, if you were going to turn it off. It indicated that you might be considering turning it back on. We were wondering whether we want to keep the lines up. Over. 057:00:35 Armstrong: Well, we - we want your recommendation on that. I think we would just as soon, ourselves, terminate the TV, but if you have a commitment to keep, we'd be more than willing to turn it back on. 057:01:25 Duke: Apollo 11, Houston. We'd like to terminate the TV. We don't - We think we've got a really - a good tape. That hour-and-a-half show was superb. And we'd like to pick up TV - correction - PTC at about 58 hours. Over. 057:01:44 Armstrong: Roger. PTC at 58 hours. 057:01:48 Duke: And we'll have the remaining functions in the Flight Plan soon. Over. This is Apollo Control at 57 hours, 3 minutes. The decision, as you heard relayed up to the crew there, that we would go into the Passive Thermal Control mode with the spacecraft in a slow roll at 58 hours in the Flight Plan, would rule out further television for today. I would also like to repeat that the change of shift press conference for the previous shift was cancelled due to the length of that television transmission, and we do expect to have a change of shift briefing following this shift, probably between 11:30 and 12 pm Central Daylight Time. At the present time, Apollo 11 is 178,236 nautical miles [330,093 km] from Earth, and the velocity has dropped down now to 3,146 feet per second [959 m/s]. At 57 hours, 4 minutes; this is Mission Control, Houston. 057:04:05 Duke: Apollo 11, Houston. Our recommendations on the activities for the next hour or so, as far as Flight Plan goes, are: Continue your LM familiarization as desired until about 58 hours, then ingress to the CSM, close the hatch, and establish PTC shortly thereafter. Over. 057:04:30 Duke: ...the water dump. Over. 057:04:34 Armstrong: Okay. Water dump being terminated now. 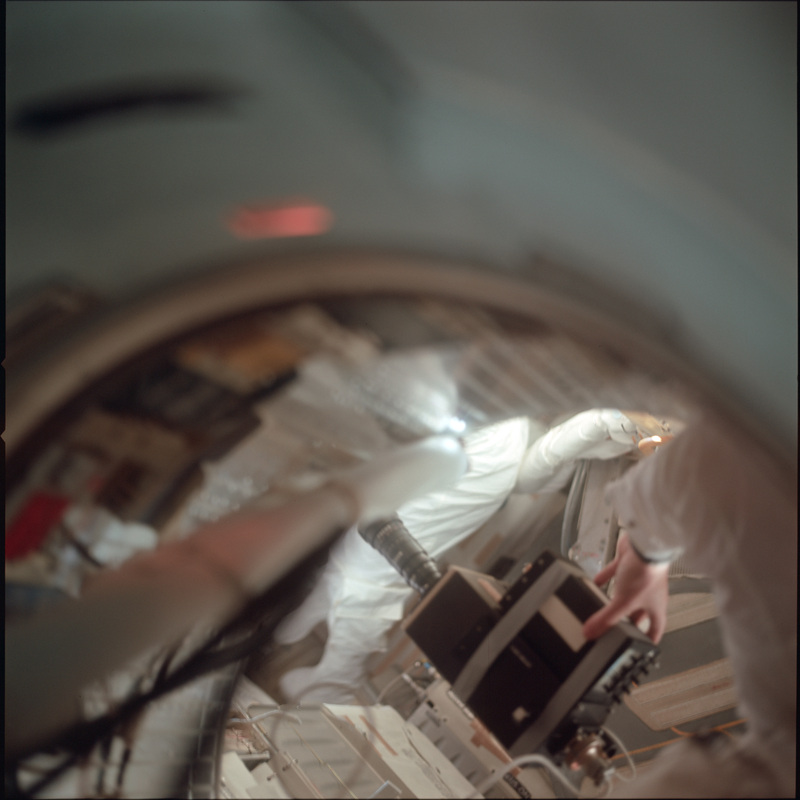 During the LM inspection, and as Buzz continued to work in the lander's cabin, a series of still Hasselblad images were taken. AS11-36-5385 - View up the tunnel towards the LM showing Neil holding the TV camera. Note how the small TV monitor has been taped to the camera body. Image by LPI. AS11-36-5386 - View up the tunnel towards the LM showing Neil holding the TV camera. Image by LPI. AS11-36-5387 - Right side of the CM cabin with window 5 and below it, panel 5. Image by LPI. AS11-36-5388 - Neil in the CM with the navigation optics panel behind him.. Image by LPI. AS11-36-5389 - Right side of LM cabin (Buzz's station) with 16-mm movie camera fitted to film out of the window. Image by LPI. AS11-36-5390 - Buzz in the LM during its checkout en route to the Moon. He is on the left side of the cabin and is placing a pair of sunglasses in his jacket's arm pocket. Image by LPI. AS11-36-5391 - Buzz in the LM during its checkout en route to the Moon. He is on the left side of the cabin. Image by LPI. AS11-36-5392 - Right side cabin (Buzz's station). The keypad is the Data Entry and Display Assembly (DEDA), Buzz's interface with the Abort Guidance System computer. To its left is the T-handle of Buzz's TTCA (Thrust/Translation Control Assembly). Image by LPI. AS11-36-5393 - Buzz in the LM cabin during activation en route to the Moon. Out of focus image. Image by LPI. AS11-36-5394 - CM exterior seen through the LM overhead window. Image includes the side hatch, pitch thrusters and EVA handles. Image by LPI. AS11-36-5395 - View through the LM overhead window. Image includes the Rendezvous Radar antenna, EVA light and the CM roll thrusters. Image by LPI. AS11-36-5396 - Buzz in the LM cabin during activation en route to the Moon. Behind him is the Interim Stowage Assembly (ISA) installed over the LM's main instrument panel. Image by LPI. AS11-36-5397 - Buzz in the LM cabin during activation en route to the Moon. He appears to be holding an example of a McDivitt purse. Image by LPI. AS11-36-5398 - Buzz at Neil's station in the LM cabin during activation en route to the Moon. Note the Crew Optical Alignment Sight (COAS) installed at the window just above his head. One of the main circuit breaker panels is on the left. Image by LPI. AS11-36-5399 - The front hatch of the LM during activation en route to the Moon. The Interim Stowage Assembly (ISA) is installed over the LM's main instrument panel. A Portable Life Support System (PLSS) backpack is on the floor with a visor stowage bag to either side. Image by LPI. Journal contributor Jon Hancock has composited some of these into a single image that shows the cabin space. AS11-36-5389 to 93 and 96 to 99 - A composite of six images produced by journal contributor Jon Hancock. 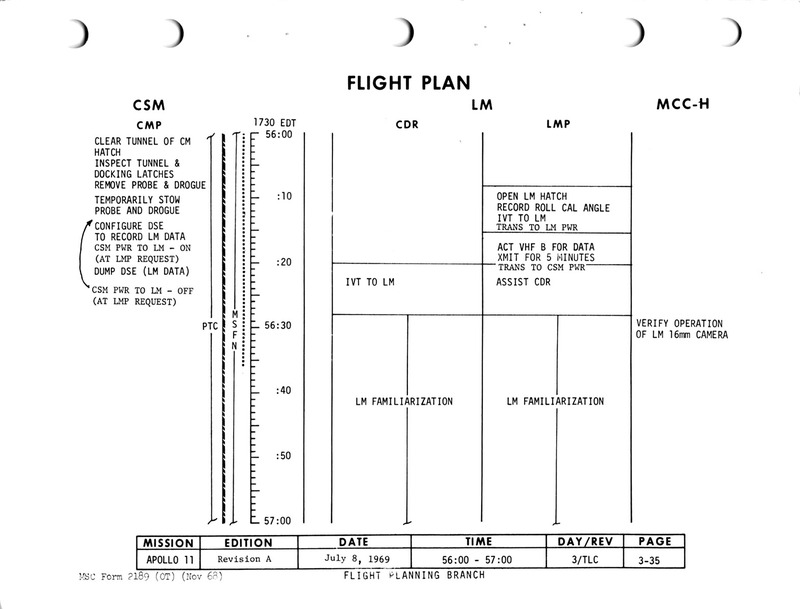 The Journal continues with the crew returning to the Command Module, updating their Flight Plans for the lunar landing, and performing maintenance on the spacecraft.